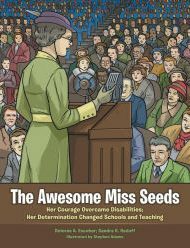 Corinne Seeds, a woman who grew up with significant hearing and eyesight disabilities, yet went on to help change the face of education in America, is the subject of Dolores Escobar and Sandra Radoff’s informative and appealing picture book The Awesome Miss Seeds. After being given thick glasses and a hearing aid, young Corinne excels at her studies and later decides to become a teacher. Influenced by John Dewey’s theories on education, which included more hands-on learning methods than typically used in schools of the early 20th century, she helps to propagate those methods, eventually becoming a recognized leader in that role. Equally admirable are the illustrations by Stephen Adams; the people he has drawn are realistic, expressive, and distinctive. Unfortunately, while children will recognize an old-style classroom in the very first picture, there’s no reference to the time period until page 19, which features a list of “Important Dates in Miss Seeds’s Life.” This can be disorienting. Following that, Escobar and Radoff offer useful notes for parents and teachers about Seeds’ school and methods. The Awesome Miss Seeds shines its spotlight on an amazing woman; it deserves a place in school libraries everywhere.